An Inspirational Leader | Fourth Dimension Inc.
R.K. Talwar was a highly respected and admired leader in the Indian banking circles. 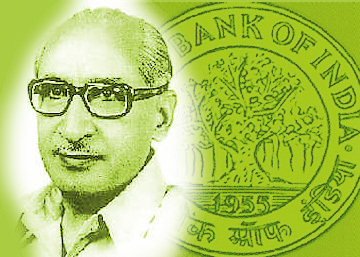 He served as the Chairman of State Bank of India from 1943 to 1969. He was an inspirational leader, who became a role model of values for many young officers. In this article, a close associate of Talwar, who later became the Chairman of ICICI, recounts some of the motivational qualities of his mentor and leader. Nurturing people; a role model. I distinctly recall when in the early days of acquaintance with him I had occasion to submit to him a loan proposal. He called me to his room and told me that the proposal was not in the format he could approve of. He always wanted the proposal in a particular format and since he did not have the time to explain this to me he asked me to go and meet a particular gentleman who was sitting in the main hall, who knew exactly what he had in mind. Soon after I left his room, I went straight to this gentleman and found that he was a junior clerk in the Bank. Of course, this did not matter to me. I was only keen to learn from him as to how I should modify the proposal in a manner acceptable to Talwar. I spent perhaps an hour with him trying to probe him with a lot of questions and when I ultimately went back to my seat my intercom rang and Talwar was on the line. He asked me to go and see him immediately. When I went, he looked at me and said, “I have been in this office for nearly six months now, and every time anybody submitted a proposal, I told them exactly what I told you. Whenever they found the person to whom I was directing them was a clerk, either they avoided him or they summoned him to their room to explain to them what I wanted. You are the first person who went straight from my room and sat with him as a student. I thought I should tell you that this is exactly the trait which would take you far in the Bank.” Sometime I always wondered whether his positive bias towards me was strongly influenced by this single incident. Almost every one of his “favourites” will have some similar story to narrate, to illustrate what mechanisms he used to employ to find out whether the persons were worthy of his mentorship. The mentorship he practised was subtle. There was no conscious attempt to coach or preach. Most often it was a hint here and there. More essentially it was the opportunity for frequent interaction which enabled the youngsters to gain access to his mind and the thoughts that floated from it. The relationship between Talwar and the young brigade, as the group of youngsters came to be known, was viewed with considerable disfavour by the senior executives who were used to a strict hierarchical line of control that prevailed earlier in the Imperial Bank and continued in the State Bank as well. This led to a considerable amount of hostility between the seniors and Talwar and also created certain problems for the juniors, who were often accused of side-stepping their immediate superiors to take matters up directly at a higher level. This used to come up for a more open discussion once in a while but Talwar used to ignore it and did not feel it necessary to make a change in his style of leadership. This pattern of leadership was to continue right till the time he relinquished charge of the Bank. As a consequence, the State Bank of India became a very rich talent factory, which supplied a large number of outstanding executives right across the banking system and the credit for this would squarely belong to Talwar alone. Talwar was a person of unimpeachable honesty and integrity is hardly a matter of surprise. Had this not been an integral aspect of his personality, it would not have been possible for him to take a firm stand with regard to the political system as well as the Bank’s clients whenever the occasion demanded. Under his leadership, State Bank of India quickly came to be recognized as a Bank with a difference, consisting of officers who displayed the highest sense of honesty and professionalism, apart from a high level of competence. I have often heard this being mentioned in the Reserve Bank and Government of India circles that one could easily pick unerringly a State Bank of India officer from amongst an assembly of bankers. Once during a conversation we had on the question of honesty, Talwar remarked that it would be difficult for anybody to consciously cultivate the value of honesty. It should be a part of his personality. He wondered whether he had any option other than to be honest because the alternative never even occurred to him. This is, of course, equally true in respect of other aspects of leadership as well. It is very difficult to deliberately cultivate them – they have to stem from a basic transformation of one’s entire personality. Talwar was short statured but possessed a striking personality. When he entered a room his presence was felt by everybody. He was not a great orator but when he spoke he was listened to with attention. There was hardly a superfluous word or sentence in his speech. He resented small talk and was reluctant to participate in useless banters. As a rule, he did not attend any parties unless they were official parties either hosted by him or by the Reserve Bank of India or the Finance Minister. He did not drink even though he ate meat. His overall personality sometimes gave an impression that he was quite overbearing and arrogant. Only those who were in his inner circle really knew that Talwar was a person who was totally bereft of Ego. Because of his strong belief in his being an instrument of the Divine, his own individual personality was fully submerged with that of the Divine and the feeling of humility was very much inherent in his overall being. On the first day of his assumption of the office as Chairman he called me to his room and offered me the post of his secretary, which I accepted with delight. I sat with him to discuss as to what we should be doing and what should be our priorities. During the course of the conversation, I remarked, “Sir, during your tenure as Chairman we should ensure…” He immediately stopped me and said, “Vaghul, never again bring this phrase ‘during my tenure’, I as an individual do not matter. I can never let the thought enter into my mind that I am the doer. I am here in this office because of the Divine Will and my duty is to serve Him and obey His command.” This was an important lesson for me. I had by then read enough of the metaphysics to understand about the surrender to the Divine and performing one’s duty with a sense of detachment. But, for the first time, I saw a practical demonstration of what this was all about. Dave tells me that something identical happened with him when Talwar became Chairman of IDBI in 1980. He also had inadvertently remarked about what should be done during Talwar’s tenure. Talwar cut him short and told him that they were talking about the institution and not about his tenure as a Chairman. The complete absence of Ego was apparent for all those who became his ardent disciples and this was a major motivator in inspiring people to a new behaviour leading to their transformation. Under Talwar’s leadership, State Bank of India acquired the highest level of professionalism. The State Bank officers acquired a reputation for the clean and business like manner in which they processed the loan proposals. Compared to the rest of the banking system at that time, which was characterized by a cozy relationship between the senior bank executives and the big industrialists, this approach of the State Bank of India brought about a refreshing change. But at the same time, it also made life somewhat difficult for some of the industrialists, who were accustomed to getting what they wanted, regardless of the fact whether their business needed the funds or not or whether their businesses were being managed in an efficient manner. In fact, when Talwar was in charge of the loans department at Kolkata office in the late 50s, he had a stormy relationship with the jute barons when he insisted on a measure of financial discipline. Apparently they found him very inconvenient to handle and just to get rid off him they seemed to have offered the position as a General Manager in Punjab National Bank – a position which is equivalent to that of a CEO. The author is the Former Chairman of ICICI Bank Limited. He is widely recognized in India for his role in pioneering the concept of the Universal Banking Model that laid the foundation for a new era in Indian Banking. He was mentored by Late Mr. R.K. Talwar during his tenure at State Bank of India and one of the few whom Shri Talwar confided in.